The LangLion Platform helps you to control all of the daily tasks at your language school. Check out what you can achieve thanks to the LangLion Platform. The modular structure of LangLion is not only convenient for a director, but also for students, teachers, and office employees. Reduce costs - manage your language school by using one system. Improve your administration responsibilities thanks to our automatic scheduling system and convenient payroll tools. Contact your students at any time, send them scores, and inform them about changes in the schedule. Inform the whole group about canceled classes or a change in the schedule with e-mails or SMS messages. LangLion is a Platform that helps you to organize your work more efficiently: from office tasks, financial control, sharing files and evaluating students, through online lessons. LangLion covers it all. Automatically and comfortably schedule lessons, group your students, assign teachers and search for free classrooms. At any time contact your students; you don't have to be at your office. Check attendance, share test scores and class details. Analyze your volume of sales, check profitability of particular courses, monitor teachers' efficiency. Teach online, at any time and place. Share your camera, audio and a virtual whiteboard. In a blink of an eye, charge your customers, pay your teachers, issue online invoices and supervise your debtors. Share learning materials, create interactive tests, share scores easily. 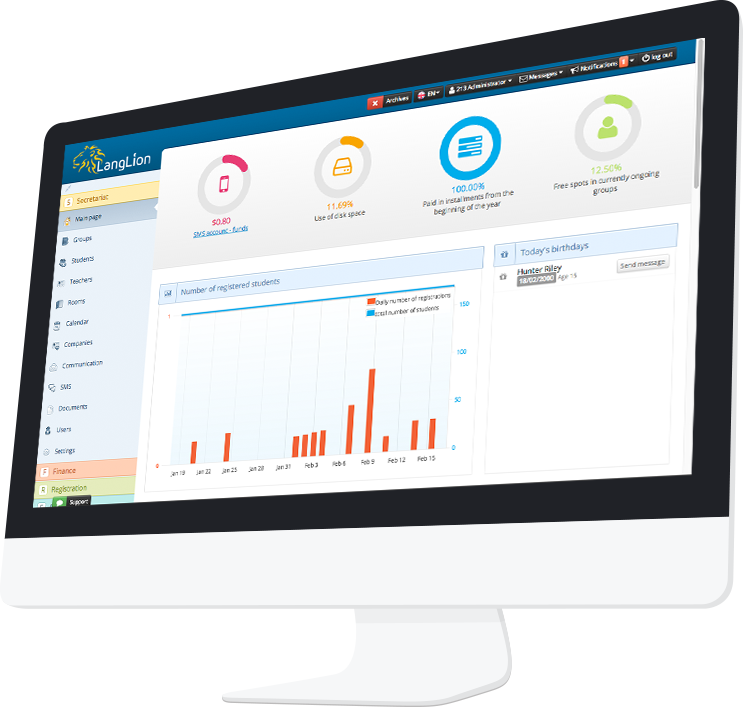 Integrate LangLion with your site, evaluate potential students with auto-correcting placement tests. Reserve, lend and monitor return dates of the items from your library. Check your customer satisfaction level, gather research results about their needs and opinions, optimize your strategy. Offer a quick payment solution and forget about delays. We have been using Langlion since the beginning of September 2015 and I must say it is a very complete package for language school administration, so much so that it has taken us a month to really understand how to use it as it's quite complex. We have been using the LangLion platform for well over six months and our students, teachers and staff are all really satisfied with it. The team at LangLion is always prepared to assist us with any questions we might have and when there is an issue, it is solved immediately. The money and time invested into the LangLion has already returned in more ways than one. We use the LangLion platform as our Language School management system, and are delighted with its ease of use, its comprehensive support of our processes, and the fact that we have access to all of our information from any internet browser. Check how the LangLion Platform works for 14 days, completely free, no strings attached.